At Saltus, one of our mandates is to educate athletes on appropriate training methods and principles. However, several poor training practices have emerged recently on social media that set a poor example for young athletes. Gimmicks aren’t better, better is better. This is the second installment in our blog series that highlights ill-advised training practices. If you haven’t checked it out already, read the first blog in the series where we cover why agility ladders are a poor tool when training for speed, agility, and explosiveness. However, young athletes should not buy into the marketing schemes of one of the WORST training tools that you can purchase. Regardless of the altitude, the percentage of oxygen in the air remains constant at 21%. However, as altitude increases above sea level, the ambient atmospheric pressure decreases, resulting in less oxygen being readily available to be absorbed into the blood. To cope with this decrease in oxygen, the body experiences a number of physiological changes in order to adapt. Acute changes in the cardiovascular and pulmonary systems include an increased ventilation rate, as well as increased cardiac output. Simply put, this means that both the heart and respiratory system work harder in order to deliver more oxygen throughout the body. The biggest physiological change that improves performance, however, is hematological; the body creates more red blood cells, which allows more oxygen to be carried. These physiological changes that occur in response to low oxygen environments are collectively referred to as acclimatization, and this is the primary reason why some endurance athletes participate in blood doping. In blood doping, blood is extracted from the body, stored, and then reintroduced at a later date in order to increase the red blood cell count, allowing more oxygen to be delivered, which can increase VO2 max and in turn, endurance and performance. WHY DON’T ALTITUDE MASKS WORK? Elevation masks attempt to mimic the training environment that occurs when elite athletes train at high altitudes in preparation for a competition, but it is clear that they areway off base when it comes to science. Firstly, it typically takes weeks of living at altitude in order to properly acclimatize. Strapping on a mask for an hour-long workout a couple times per week is not going to cut it. Secondly, wearing an altitude mask does not change the partial pressure of oxygen in the atmosphere, and therefore the body does not have a reason to acclimatize and produce more red blood cells. All it accomplishes is that it makes it more difficult to breathe. Some may claim that this strengthens the diaphragm, which would in turn increase performance. However, the respiratory system is very rarely a performance limiter, as normal blood oxygen saturation levels are typically 95-100%. Instead, VO2 max and endurance performance is affected by the ability to deliver oxygen (e.g. cardiac output / stroke volume), and the ability to extract oxygen (e.g. hemoglobin count, capillary density). Lastly, the gold standard of altitude training involves living high and training low. That means athletes live at a high altitudes (or in altitude tents) in order to acclimatize, but then travel to sea level to train. This is because training quality decreases in low oxygen environments, and you always want training quality to remain high. If training quality decreases, there is a diminished stimulus that may not produce an optimal adaptation/supercompensation response. In conclusion, altitude training masks are one of the worst training tools you can use. Essentially, you receive none of the benefits of training at high altitude, but all of the drawbacks. The body does not acclimatize to increase the oxygen carrying capabilities of the blood, and training quality suffers and you can’t train as hard because you’re wearing a silly looking mask on your face. Interestingly, the effectiveness of properly administered altitude training is still questionable. In one of the best double-blind, placebo-controlled research studies conducted on altitude training, Siebenmann et al. (2012) concluded that there was no difference in performance when a live high, train low protocol was administered. As a result, speed/power team sport athletes would be better off working on aspects that make a difference in their respective sports, namely speed, power and skill. 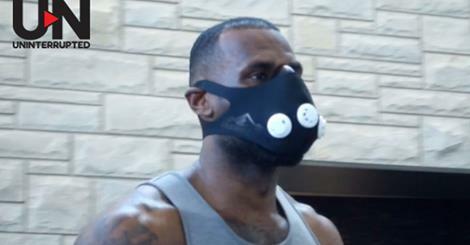 LeBron James was shown using a training mask in preparation for the second round of this year’s NBA playoffs. However, just because the best basketball player on the planet uses them doesn’t mean that you should too. After all, LeBron has a track record making poor training decisions, like when he chose to follow the Paleo diet and balance on exercise balls in the off-season, resulting in him losing a significant amount of muscle mass, strength and power, and having a very slow (pun intended) start to his season. Save yourself the embarrassment and leave the masks to comic books.